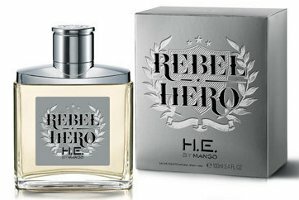 Spanish fashion brand Mango has launched Rebel Hero, a new fragrance for their H.E. by Mango line. Rebel Hero is the masculine counterpart to 2009's Lady Rebel. Notes include mojito and gin & tonic accords, with lime, grapefruit, aromatic-spicy accords and sandalwood. Mango Rebel Hero is available in 100 ml Eau de Toilette.